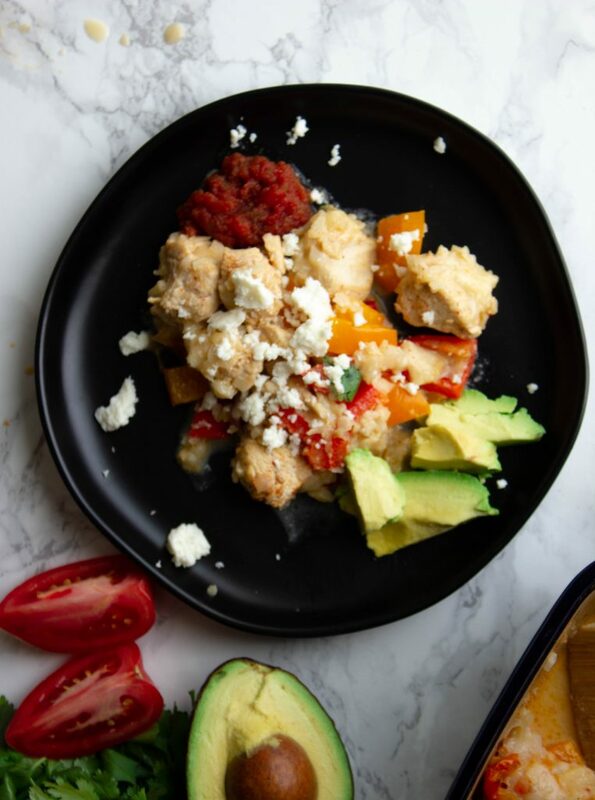 Spice up your next low carb taco Tuesday with this keto fajita casserole. 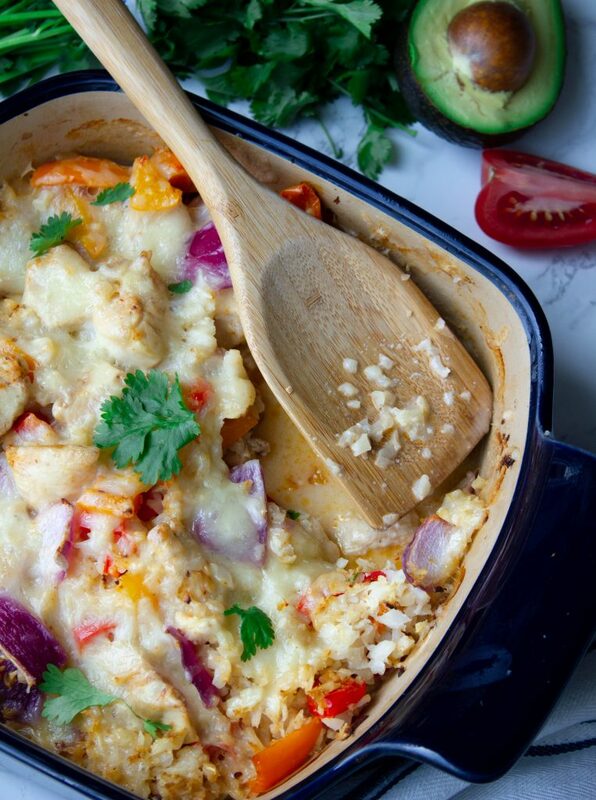 A Mexican inspired keto casserole that is just 7 net carbs per serving. Casseroles, or covered dishes as we call them down South, are one of my favorite recipes to create. A full meal that only requires a handful of ingredients, minimal hands on time, and zero babysitting? Yes, please! Casseroles are akin to the kitchen nanny for anyone who is short on time to cook. In fact, this recipe was born one day when I had zero time to fix supper and needed something I could prep ahead of time with only the ingredients I had in the refrigerator. Get more Keto Mexican recipes here! The thing about casseroles is that folks tend to assume they’re full of canned soups, butter crackers, and sour cream. I suppose those stereotypes are true in some recipes as I can think of a few fitting classic casseroles off the top of my head. But it is possible to make casseroles without those ingredients. 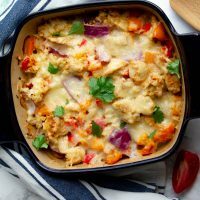 It’s even possible to make casseroles keto friendly! Take this casserole, for example. Using only what I had in the refrigerator, I made an entire meal that’s clean and healthy! 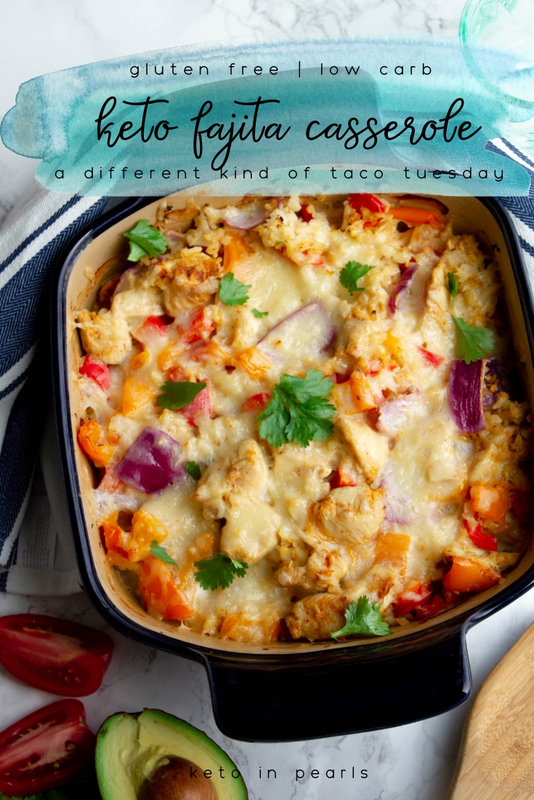 I had chicken, peppers, and some onion that I needed to use up before they went bad and I knew that I wanted to make a Mexican inspired casserole because [keto] Mexican food is my favorite! 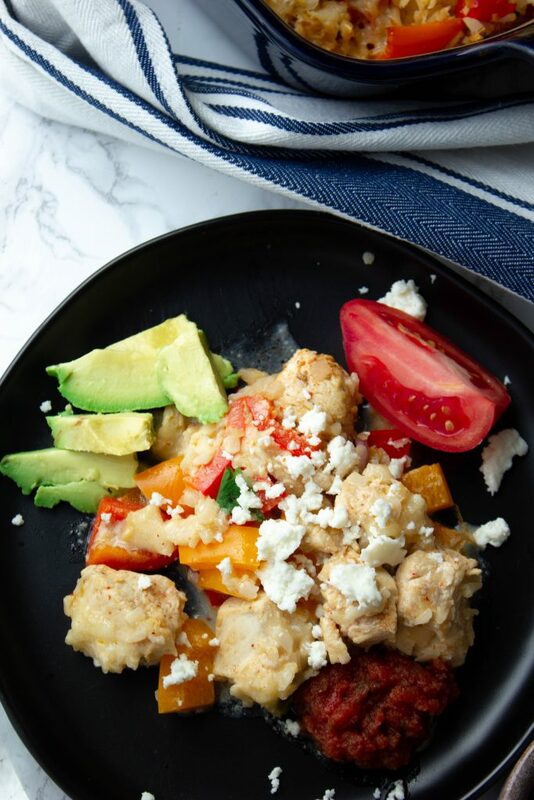 Think of this casserole as a plate of keto fajitas with all the fixins. The dish is bulked up with cauliflower rice and gets its melty gooeyness from white queso and Monterey Jack cheese. You may use fresh or frozen cauliflower rice in your casserole. If you use frozen cauliflower rice, you very well may have some liquid at the bottom of the casserole after baking. It won’t affect the taste or ruin the meal but fresh cauliflower rice (appropriately called cauliflower pearls) won’t release the same amount of water. Whenever I make casseroles that are a bit watery at the bottom, I just drain the liquid into the sink after making the first plate. 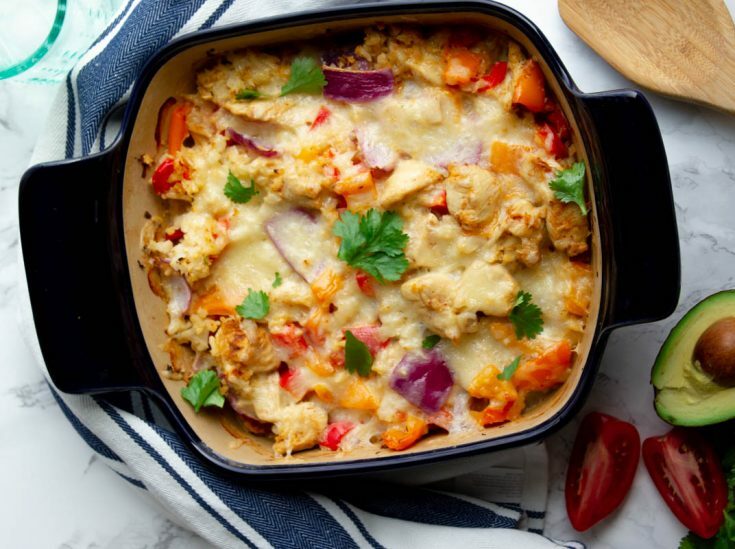 You could easily prep this keto casserole ahead of time and bake it when you’re ready to eat. 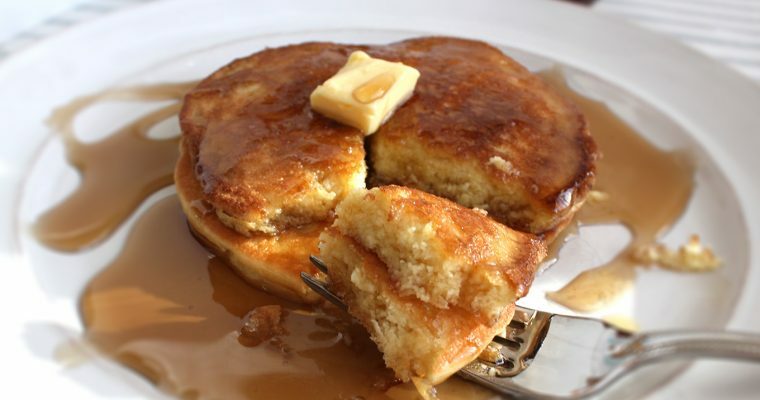 Or, you could even bake it ahead of time and just reheat individual plates for supper–this is actually what I did for my family! And just like any good plate of [keto] fajitas would have, load your plate up with avocado, salsa, or my personal favorite, cotija cheese! Oh, and don’t forget fresh cilantro! Fun fact: Coriander and cilantro come from the same plant! Cut chicken breasts into 1 inch pieces. In a small bowl, combine the spices. Season the chicken with half of the seasoning. In a large skillet, heat half of the butter (or oil). Once hot, add half of the chicken. Cook 3 to 4 minutes until browned. They do not have to be cooked through as they will finish cooking in the oven. Transfer to a large bowl and repeat with remaining chicken. Add the peppers, onions, and cauliflower rice to the bowl with the chicken. Season with the remaining spices and toss to coat. Add half of the mixture to a medium sized casserole dish. Add half of the queso to the top of the mixture. Repeat once more with remaining mixture and queso. Top the casserole with the shredded Monterey Jack cheese. Bake uncovered for 25 minutes. Let the casserole rest 5 to 10 minutes before serving. My family really enjoyed this nonconventional keto taco Tuesday and I hope yours does too! Tag me on social media if you make any of my recipes! I love to see your recreations. You can find me @ keto_in_pearls on IG and Facebook!